Pour boiling water over the mushrooms and let them soak for 30 minutes. Push the mushrooms down into the water if they float. You may need to put a plate over the top to keep them submerged. I put mine in a large mason jar. Drain and reserve the liquid and then strain it through cheesecloth or through a coffee filter to remove any sediment. Set aside. Give the soaked mushrooms a rough chop. Take about half of the thyme sprigs and tie them in a bundle with a piece of string. Strip the other stems to make about 2 tablespoons of leaves. Set both aside. Meanwhile put the butter and oil into the Instant Pot and press sauté. Sauté the shallots and garlic on the 'normal' setting for a few minutes, stirring often, until they've softened. Add the rice and stir for another minute. Add the sherry to the pot and stir until it gets absorbed. Press OFF. Add 1/2 cup of the mushroom liquid and the beef broth to the pot, along with the chopped wild mushrooms, stirring to combine everything. Add the Kitchen Bouquet to the pot now, if you are using. Add the salt and pepper, along with the bundle of thyme and push it down into the liquid. Lock the lid and set the vent to SEAL. Set the Instant Pot to PRESSURE COOK on HIGH, for 6 minutes. While the risotto is cooking, sauté the fresh mushrooms in the butter until they soften and begin to brown. When the Instant Pot beeps, let the pressure release naturally (don't touch the valve) for 5 minutes, then turn the valve to VENT. When the pressure is all released, open the pot. Carefully remove the bundle of thyme and discard. Stir the cheese and loose thyme leaves into the risotto. Season with salt and pepper to taste. 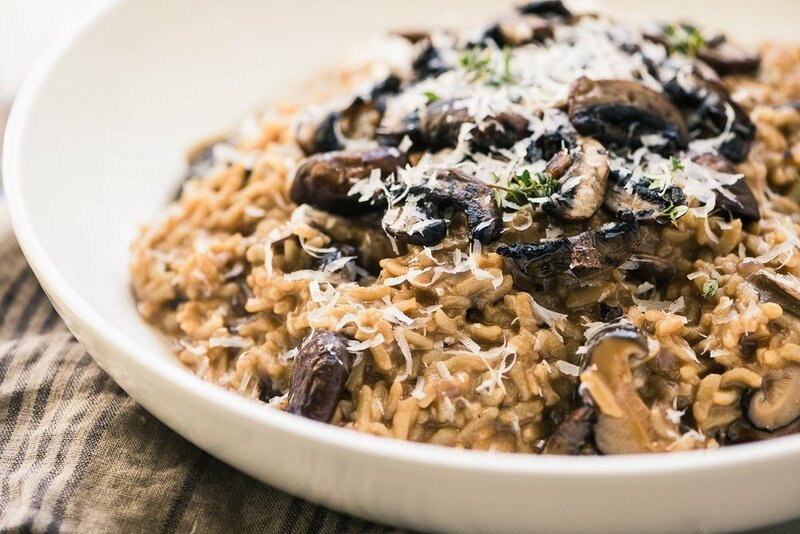 Serve the risotto topped with the sautéed mushrooms, a final shower of Parmesan cheese, and, if you're going all out, a drizzle of truffle oil.